We are familiar with the critical role of INSPIRE in searching for papers, following references, tracking the citations, and providing author profiles. Now INSPIRE is taking steps to extend this service to data, thus creating a rich new layer to the information system of high energy physics. In addition to data coming from HepData, INSPIRE now supports data hosted in other third-party data repositories such as Figshare or The Dataverse Network. To test this out, I put some data from a phenomenological study of the CMSSM onto Dataverse -- yes, theorists create data too! In this case, Dataverse issued the persistent identifier to our data since they take on the responsibility to store it. I sent the persistent identifier to INSPIRE and now it shows up in the data tab of our original paper. 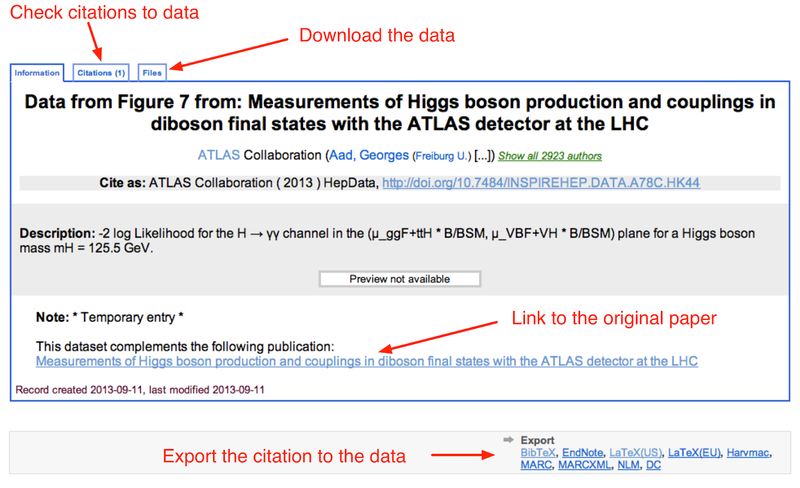 INSPIRE can now track citations to this data, which is hosted remotely. Nice! The last example comes from a not-so-high-energy experiment I was involved in called APEX at Jefferson Lab, which is searching for evidence of a 5th fundamental force of nature together with similar experiments such as DarkLight, HPS, and MAMI. Unlike the enormous LHC experiments, APEX had 66 collaborators that contributed to the test-run for this small, special-purpose experiment. The results of the test run were published in 2011, and this week the raw mass distribution from those 770,509 events collected by APEX was released directly on INSPIRE.